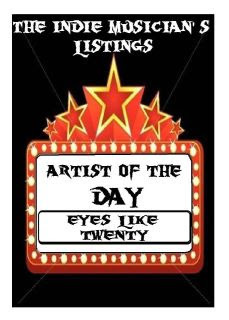 KBM Management (Promotion Page): Eyes Like 20 - Band of the Day ! https://www.reverbnation.com/eyeslike20 — with Richey Boyd. Inspired by the likes of Tool, Soundgarden, Alice in Chains, and Deftones, Birmingham-based Eyes Like 20 showcase their own aggressive brand of metal-infused alternative rock with a heavy groove. Their sound is felt as much as heard. The beats will keep you dancing and the lyrics will move you while your bones rattle. Jonathan Lucas's voice, an ideal mix of soul and aggression, is the perfect compliment to the hard-riding, grinding, growling guitar work laid down by Brent Martin and Richey Boyd. The rhythm section, made up of Philip Nero on bass and John Kennedy on drums, will keep you moving for the entire show with their hard, driving, yet funky beats. Fresh out of the studio with their first professional recordings in years, EL20 is excited about getting back onto the touring circuit with a new look, new sound, and new songs. They eagerly look forward to touching base with their old fans and meeting their new ones.